Since a number of cool things are happening in space exploration these days, we'll widen the scope of this thread a smidge. Conversation about all things space exploration are welcome, whether it be from NASA, SpaceX, ULA, Blue Origin, or anyone else. Chances are most of the discussion will still be about SpaceX since they love to make things public and fun, but nothing's off limits. I'll eventually get around to modifying the OP to include resources for other companies too, but in the meantime, feel free to post any cool stuff you run across. NASATV will also cover some launches (primarily ISS resupply missions), but I honestly find their broadcasts to be pretty dull. Dragon - The cone-shaped capsule that sits at the top of the rocket for ISS-bound launches that holds the cargo (or, in the future, humans). F9 - Falcon 9, the name of the rocket itself. FH - Falcon Heavy, the three-booster version. GTO - Geosynchronous Transfer Orbit, a type of orbit that will eventually result in the satellite orbiting the earth as it turns so that it seems to be in the same spot from the ground (such as DirecTV or Dish satellites). These types of launches are particularly challenging because they require a lot of power to get them into the right orbit, leaving very little fuel left for landing. HIF - Horizontal Integration Facility - the building near the launch pad where they put all of the pieces of the rocket together before rolling it out to the pad. JRTI - Just Read The Instructions, the name of the "barge" that they land on for west-coast launches. LEO - Low Earth Orbit, a fairly low orbit shared by many satellites and ISS. 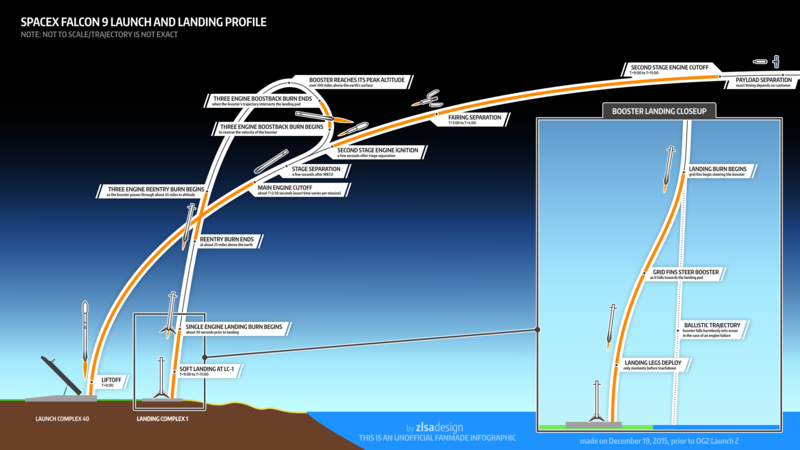 These launches usually require less power to achieve the proper orbit, so the first stage can often be landed back on land rather than on a drone ship. LZ1 - Landing Zone 1, basically a big open slab of concrete at Cape Canaveral where the first stage will attempt to land (for some launches). NET - No Earlier Than, basically the date they're hoping to launch, but rocket launches have a tendency of getting delayed. OCISLY - Of Course I Still Love You, the name of the "barge" that they land on for east-coast launches. RTLS - Return to Landing Site, a mission where the first stage comes back and lands at LZ1. It was my understanding that they were landing at Cape Canaveral, and the reason was to avoid the "moving target" that was the barge. I'd imagine they'd have less turbulent winds also. This isn't to say they've given up on barge landings, but with the B.O. landing, and the willy nilly nature of public perception, no matter how wrong, the pressure is on. They'll probably perfect landings on land, then move to the slightly more difficult barges. You could be right. I'm pretty sure that the long-term hope is that they can basically take off and land from the same place so that they can just roll it off of the landing pad and into a hangar to re-check and re-fuel, but no clue what the constraints are that they're working through between now and then. I do have to think that landing in a place with lower winds and more room for error has to be easier at least. Not that I think a ton of you are anxiously looking for the webcast tonight, but it was bumped back to the 19th in the evening. I'll bump this an hour or so before because I'm a nerd. did you see see the same launch? If I may, can you bump it like way before? I would have missed this tonight as this is my goto spot for launch talk and I was busy with the dorks in DC. Sure, I'll try to remember to give you a heads-up. Launch window is open for 3 hours (8:25-11:25 p.m. EST) on the 19th (Saturday). ^ Gentleman and a scholar. I don't really want to bump the thread every time there's some insignificant news to report, so I added a box to the OP that I'll update from time to time with the latest news. If you ever want to know what's up, search for the thread. But for now, I'm bumping it because eDave wanted to know about the launch scheduled for tomorrow, and now it's NET (no earlier than) Sunday night. Now that is what I'm talking about! All you other CP fucks should follow DaFace's lead. bumping anyway at the 2 hour countdown! Summary: sporadic showers with the possibility to be an issue are still around, and probably will remain that way through the attempt. That being said, these clouds remain pretty small / short and it seems like metar continues to report that the cloud deck isn't full overcast, so we definitely have a shot here. A instantaneous window I'd feel better about, but let's see what happens.